Bullfrogs do sleep. They sleep underground from 2- 4 weeks. [...] “The bullfrog is the only animal that never sleeps.” That’s as in N-E-V-E-R. Here’s an explanation from Rod Douglas. Although that link does not work, this archived link does work. In Chacha.com, the answer says they "Bullfrogs (Rana catesbeiana) seem not to fulfill sensory threshold criteria of sleep during resting states." 1: Search for the post "Sleep deprivation of frogs and bloggers, and the hidden meaning of Jeremiah was a bullfrog." It has been argued that the assumption that sleep is universal is based on poor evidence 7). The bullfrog is often promoted as an example of an animal that does not sleep. There is, however, only one study on this topic, published in 1967 23). This report concluded that bullfrogs do not sleep because even during the resting phase they never failed to show a change in respiratory responses after painful stimuli (cutaneous shock). The same report acknowledged that arousal thresholds could not be measured during the cyclic phases with the lowest respiratory activity, nor could they be tested with other physiological stimuli, such as light or sound. Also, the underlying assumption in that study was that shocks delivered late at night (presumably in the middle of sleep) should elicit less respiratory response than those given early in the night (when sleep had just started); however, the opposite was found 23). In fact, we now know that in rodents and humans the deepest sleep occurs early after sleep onset. At the very least, it seems that more experiments are needed before concluding that bullfrogs do not sleep. 23) Hobson JA (1967) Electrographic correlates of behavior in the frog with special reference to sleep. Electroencephalogr Clin Neurophysiol 22: 113–121. 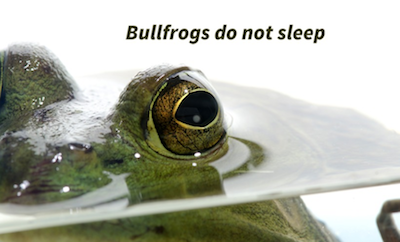 The bullfrog was chosen as an animal that doesn’t sleep because when tested for responsiveness by being shocked, it had the same reaction whether awake or resting. However, there were some problems with how the bullfrogs were tested. These problems convinced the scientists there wasn’t enough evidence that bullfrogs didn’t sleep. Not the answer you're looking for? 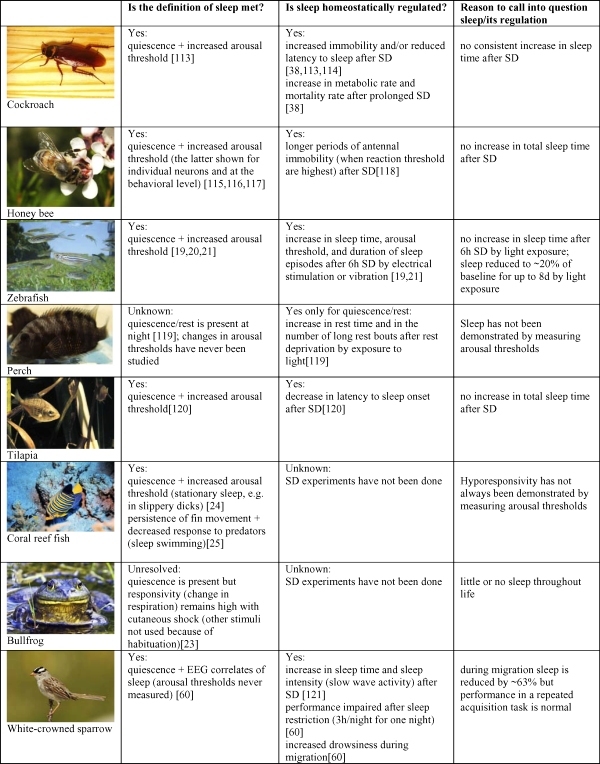 Browse other questions tagged zoology sleep . Do koalas sleep 22 hours a day?